With AVCHD coming to the fore as the HD standard for full-size consumer camcorders, Apple has made greater efforts to ensure that the video AVCHD cameras shoot can be easily imported into iMovie and Final Cut Express (for more information, check out our HD camcorder buyer's guide). But unlike with tape-based standard-definition and HDV camcorders, iMovie ’09 has to work a measure of magic to import video from AVCHD cameras (iMovie ’08 can also work with AVCHD). The import process of tapeless camcorders differs from that of tape-based camcorders in that you needn’t scan through the tape, locate the video you want, and then import it. Instead, attach an AVCHD camcorder to your Mac, launch iMovie, and initiate access on the camcorder; then iMovie ’09 will open an Import window that displays the separate clips on the camera. Within this window, you can import all the camera’s clips or, by toggling a switch at the bottom of the window from Automatic to Manual, select only the clips you want: just select each clip and then click on the Import Checked button. 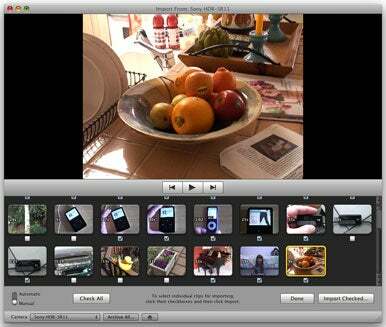 With iMovie and AVCHD camcorders, you can easily import the clips you want (or archive them all for later use). When importing the video, you choose one of two options: 960 By 540 (Large) or 1920 By 1080 (Full). This choice is important. If you intend to burn the finished video to DVD, to create a movie that you’ll display on your Apple TV or your iPod or iPhone plugged into a TV, or to share your video on the Web in standard definition, choose the 960 By 540 pixel option. This will produce a video that looks clean on all these devices, because iMovie automatically takes care of the jagged lines caused by interlaced video (as you’d get from a camcorder that shoots 1080i video). If you want your movie to stay in a native HD format—1080i or 720p—so you can view it in its original state, put it on a Blu-ray-compatible disc, or later convert it to 720p for distribution on a video-sharing site that supports HD video, choose the 1920 By 1080 option. (You can also choose to archive the contents of your camcorder and import it into iMovie at a later date using the Archive All button). Exporting video imported at the 960 By 540 setting is easy. Choose the setting you want from iMovie ’09’s Share menu, and the video that pops out the other end will look as good as the encoder you choose can make it. With a utility such as ShedWorx's VoltaicHD, you can convert an AVCHD camcorder's clips to a format friendly to a PowerPC- or older Intel-based Mac. PowerPC Macs don’t support AVCHD editing. However, you can use one of a handful of utilities to convert AVCHD files to a format compatible with iMovie ’09 on a PowerPC. One such utility is ShedWorx’s $35 VoltaicHD. Just copy a .mts file (the file format AVCHD camcorders use) to your computer, bring it into VoltaicHD, choose an export file format within VoltaicHD’s preferences area, and click on Start. Conversion can be slow—tens of minutes for a minute of video. Roxio’s $100 Toast Titanium 10 can also convert AVCHD files to other video formats. And the free HandBrake can convert .mts files to MPEG-4 and H.264 files. And the pocket camcorders? Easy. When you plug one into your Mac, iPhoto will launch by default and offer to import the videos from your camera. You can either click on Import All or select the videos you want and click on Import Selected. Within iMovie ’08 and ’09, you can access those videos by clicking on the iPhoto Videos entry in the Event Library pane.